USS Enterprise Captain Relieved Of Command : The Two-Way Capt. Owen Honors made raunchy videos to show to the crew of the aircraft carrier. He displayed a "profound lack of good judgment," says Adm. John Harvey, his superior. Update at 2:22 p.m. ET: From the Pentagon, NPR's Tom Bowman reports that Adm. John Harvey, commander of U.S. Fleet Forces Command, just made the formal announcement that Capt. Owen Honors has been permanently relieved of command of the aircraft carrier USS Enterprise. Harvey cited what he said was Honors' "profound lack of good judgment" in making the raunchy videos that came to light this week. And, "I have lost faith in his ability to command the Enterprise," Harvey added. Update at 10:05 a.m. ET: We've changed the headline on this post to reflect the breaking news from CNN and the AP that "senior defense officials" say USS Enterprise Capt. Owen Honors will be relieved of his command because of raunchy videos he produced and broadcast to the crew aboard the aircraft carrier. The headline at The Virginian-Pilot this morning asks whether Capt. Owen Honors of the USS Enterprise is "Sunk?" 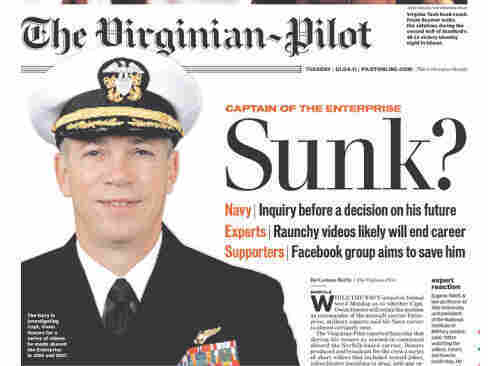 On its website, the newspaper is a bit more definitive: "Enterprise Skipper's Career Is Likely Sunk, Experts Say." "While the Navy issued no formal word Monday as to whether Capt. Owen Honors will retain his position as commander of the aircraft carrier Enterprise, military experts said his Navy career is almost certainly over." That certainly seems to be in line with what JJ reported yesterday, that "Getting Fired By The Navy Isn't Hard To Do." In case you're just catching up on this story, we reported yesterday on the videos Honors made -- and showed to the 6,000 or so sailors and Marines aboard the Enterprise -- several years ago when he was the aircraft carrier's second-in-command. Meant to be entertaining, they included anti-gay slurs, simulated masturbation, the simulated eating of human excrement, a discussion of profanity and sexually-themed shower scenes. There is an online effort underway to show support for Honors. A Facebook page called "Support Captain Owen Honors - USS Enterprise" has more than 6,600 "friends" at this hour. On the ship's official Facebook page, there's a spirited discussion underway that includes messages of support for Honors and messages that condemn his actions. Navy Times is asking its online readers for their opinions on what should happen to Honors and his superior officers. "Defense officials: Navy will relieve aircraft carrier commander over sexually explicit videos."